A Brief History of the life of Swami Lakshmanjoo. The young boy approached his spiritual practice with burning zeal and had his first glimpse of God Consciousness at the age of nineteen. After that glimps of the Divine he took a vow of lifelong celibacy and dedication to the realization of the highest state of God Consciousness. 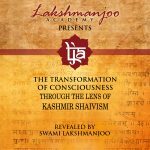 During the next three decades Swami Lakshmanjoo soaked himself in the oceanic depths of Kashmir Shaiva philosophy, at every step verifying his intellectual understanding with his own personal experience. 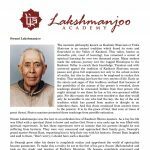 By 1965 news had quietly spread that the oral tradition of Kashmir Shaivism was alive and well, fully embodied in the person of Swami Lakshmanjoo. For the next thirty years a regular stream of visitors from India and abroad sought his audience. To all sincere seekers Swamiji freely distributed the treasure of his wisdom. 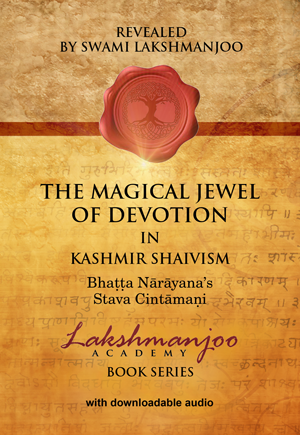 As the last in an unbroken chain of Masters of this unique ‘oral tradition’ Swami Lakshmanjoo dedicated his life to the sacred teachings of Kashmir Shaivism. In 1991 he left this mortal world but not before giving clear guidelines for the future. In India he established the Ishwara Ashram Trust to carry out activities in a manner which would uphold the truths he himself had lived for. In the United States, for the purpose of carrying his message to all who had a spiritual thirst and longed to know the ultimate truth of life, Swamiji laid the foundation for the establishment of the Universal Shaiva Fellowship.